burst of August 27 1998. Near the end of its life, a star more massive than our Sun finds itself no longer able to support its own weight from the crush of gravity and so it collapses, producing an expanding shock wave that sweeps through the surrounding gas, creating what is called a supernova remnant. All that remains of the original star is a dense, compact object known as a neutron star. Magnetars are the latest addition to the "zoo" of neutron stars and they are truly exotic beasts with magnetic fields hundreds of millions of times stronger than have ever been seen on Earth. The story which led to the prediction of magnetars and then to their discovery is given elsewhere. Here we will focus on the other part of the story, the supernova remnants born at the same time as magnetars and the diffuse emission produced by the energetic outpourings of the magnetars. All four of the soft gamma-ray repeaters that we currently know are located in or near a supernova remnant. It was this discovery that led astronomers to determine that soft gamma-ray repeaters were in our Galaxy and the nearby galaxy known as the Large Magellanic Cloud. Through the study of these supernova remnants, astronomers were able to infer that soft gamma-ray repeaters were solitary young neutron stars speeding away from their birthplace at 3 million miles per hour. Theories predict that the same process which can produce the fantastic bursts of hard X-ray emission that give soft gamma-ray repeaters their name, can also accelerate particles (electrons, protons, etc) to speeds approaching the speed of light. As the saying goes, "where there's smoke there's fire" and this case is no exception. Most of the energy released by the burst event is carried away by these high energy particles and not the gamma-ray burst itself. As the particles spiral in the surrounding magnetic field, they too emit radiation, creating extended nebulae called "plerions". Provided there is some way to confine the outflow, these plerions act as "wind bags" containing the accumulated history of this bursting activity. The study of these plerionic supernova remnants (detailed below) gives us a new and different perspective on the magnetar phenomena. SGR 0526-66 lays claim to having produced the brightest gamma-ray burst ever observed: the famous March 5 1979 burst. Owing to the large number of satellites which saw this burst (10 in total) an accurate position could be determined. This put SGR 0526-66 on the edge of the supernova remnant N49 in the Large Magellanic Cloud 180,000 light years from our Sun. This should have been sufficient to convince everyone that the burst and the supernova remnant were associated. However, in 1979 astronomers were working under the misconception that all gamma-ray bursts came from a local (500 light years) population of neutron stars. This new piece of the puzzle didn't fit. Real progress in this area had to wait until the mid-1980's when soft gamma-ray repeaters were recognized as a distinct class of high energy transient and then in the early 1990's when SGR 1806-20 was tied to its supernova remnant (see below). The significance of two other important clues also went unnoticed in the early 1980's. The first was the large offset in the location of SGR 0526-66 from the center of the supernova remnant (i.e. its birthplace) and the second was a compact X-ray source at this same location. These observations, combined with the known age of the supernova remnant (5000 years), require that the magnetar be moving at a high speed and depositing energy into its surroundings as it goes. While SGR 1806-20 was the most prolific burster in the 1980's, its true location wasn't known until it was detected by the Japanese X-ray ASCA satellite in 1993, verifying an earlier claim that it was associated with the supernova remnant G10.0-0.3. SGR 1806-20 lies at the center of this egg-shaped supernova remnant whose radio emission peaks toward the center and falls away at its outer edge. On both large scales and small scales G10.0-0.3 fits the conventional definition of a plerion. Prior to the discovery of the pulsed X-ray emission from this magnetar, this nebula was the best evidence that an unusual neutron star was powering its emission. Closer in to SGR 1806-20 the radio images made at the Very Large Array show evidence of large scale outflow of particles that has persisted for a long time. This out-flowing particle wind is especially evident in the abrupt changes seen from a jet-like feature centered on SGR 1806-20, where the "jet" was seen to rotate on the sky by 50 degrees in 1.4 years. The properties of this source are best understood if it is the result of a sudden injection of electrons accelerated nearly at the speed of light and produced as part of the high energy bursts from magnetars. Comparison of the energy contained in these particles versus the total energy released by the flashes of high energy light, shows that the particles are a significant (if not dominant) part of the total energy in these bursts. Moreover, because the lifetime of the particles is so long, studying the plerions is much like looking at the rings of a tree: the burst history of the magnetar is revealed through the study of the plerion. Figure Caption: Two views toward SGR 1806-20. These radio images, taken with the Very Large Array, were made 1.4 years apart on 1994 March (left) and 1995 August (right). A jet-like feature is seen to rotate on the sky during this time. This behavior is thought to result from the sudden injection of high energy particles from the magnetar. Until recently you could have been excused for thinking that SGR 1900+14 was the least interesting of the four SGRs. It was somewhat inactive as a gamma-ray source, bursting a few times in 1979 and again in 1993. An approximate position for SGR 1900+14 has been determined via triangulation of burst arrival times from the satellites in the Interplanetary Network (IPN). In the next figure we superimpose this long needle-like region on a radio image of the sky taken in this direction. 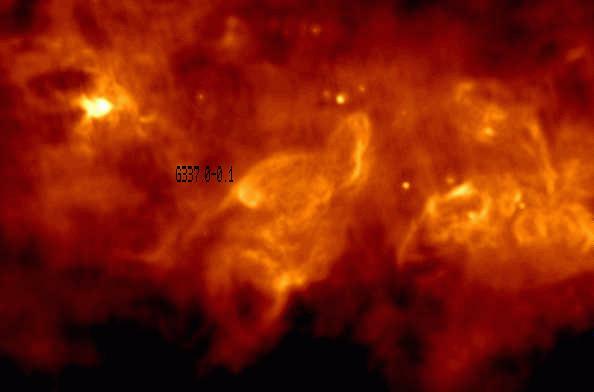 There is an X-ray source interior to this which is thought to be the quiescent X-ray emission from SGR 1900+14. The X-ray source, which goes by the name of RX J190717+0919.3, lies just outside the galactic supernova remnant G42.8+0.6. This is a fairly ordinary-looking supernova remnant located some 15,000 light years from the Sun, and is less than 10,000 years old. It is likely (but still unproven) that SGR 1900+14 and G42.8+0.6 were born in the same explosive event but SGR 1900+14 caught up with and punched through the expanding supernova shock. In late May and late August of this year SGR 1900+14 awoke from its slumber and began bursting like never before. Numerous bright bursts occurred during these two active periods. On August 27 an intense burst occurred that was reminiscent of the famous March 5 1979 burst from SGR 0526-66, causing the detectors of several satellites to saturate. Click here to see the light curve of the August 27 burst as detected by the Ulysses satellite. Shortly after the August 27 burst we observed the region around the quiescent X-ray emission from SGR 1900+14 using the Very Large Array in Socorro, New Mexico. 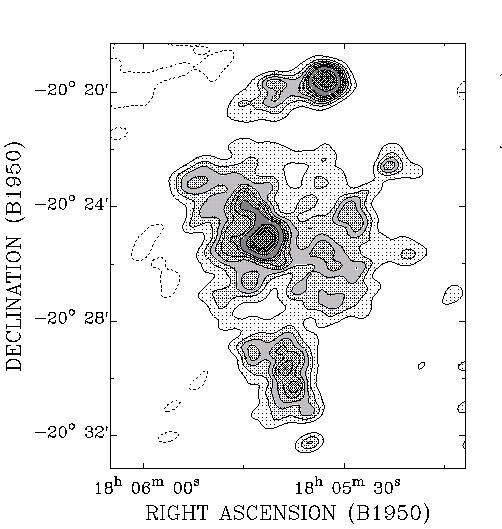 While prior observations of this region have shown only empty sky, our observations in early September 1998 detected a new radio source coincident (within the position uncertainties) with the X-ray source. As an added bonus the discovery of this nebula gives us a position for SGR 1900+14 with sufficient accuracy to search for an optical counterpart. Perhaps even more interestingly than the detection of the radio source was the fact that it was short-lived, fading below detection in only one week. At the top of this page we show a movie of this fast fading source. In a forthcoming scientific paper we argue that we have detected a radio nebula shining in the light of particles accelerated to nearly the speed of light by the same event that gave rise to the bright gamma-ray bursts. Figure Caption: Two views toward SGR 1900+14. 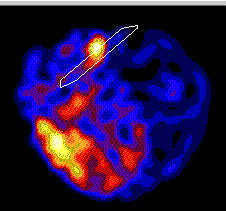 These radio images, taken with the Very Large Array, were made on 1998 June 25 (left) and September 3 (right). 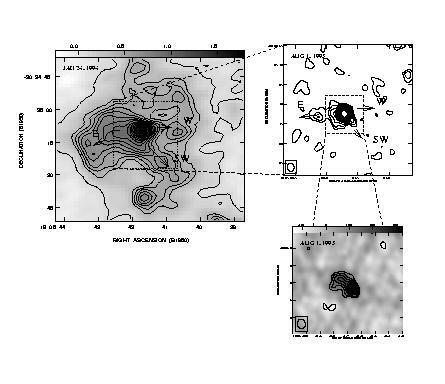 The position of the quiescent X-ray source RX J190717+0919.3, thought to indicate the approximate location of SGR 1900+14, is indicated by the circle. The radio source turned on shortly after the bright gamma-ray burst of August 27th and then rapidly faded from view a week later. SGR 1627-41 is the newest member of the SGR family. See the NASA press release announcing this exciting discovery. While its position is not well-determined yet, there is only one known supernova remnant in the region: G337.0-0.1. It is a compact supernova remnant 35,000 light years from the Sun which lies in the CTB 33 complex (see below), a young region with plenty of active star formation going on. Figure Caption: A radio image of the CTB33 complex taken with the Australia Telescope Compact Array (ATCA). The supernova remnant G337.0-0.1 is the bright, compact shell of emission just left of the center of the image. Most of the remaining diffuse and filamentary emission is from hot, thermal gas ionized by young stars in the CTB 33 complex.